“All she had to say was…..’she’s twenty’…….and my heart was broken”. As soon as she spoke I looked up at her tears and immediately stared into a face of pain. I let her continue and only got these very basic facts. She was flying alone to Tel Aviv to rush to her daughter’s side who was intensive care. Her reason for approaching me instead of using the kiosk was pretty simple…”I’m too distraught to concentrate”. My heart softened. I know I was born to comfort people. My nature and that is when I am called upon in time of need, I respond with great compassion. I can be the most mixed up and confused soul when confronted with my own desires and needs but when someone needs me – I become another person. I gave this woman my full attention and checked her in as quickly and quietly as possible – took her bag – tried to calm her. The thing I chose to tell her was what she needed and that was……”You are doing the most you can, right here, right now; the distance you have no control over.” She nodded and became quiet for just a few seconds. Just typing that out makes me pause …once more. It was as if someone was guiding her to tell me that fact. Then my own eyes filled with tears and I had a hard time speaking. So just before I sent her to her gate, I asked if I could walk around in front of the counter to her in which she sadly nodded in an appreciative way. 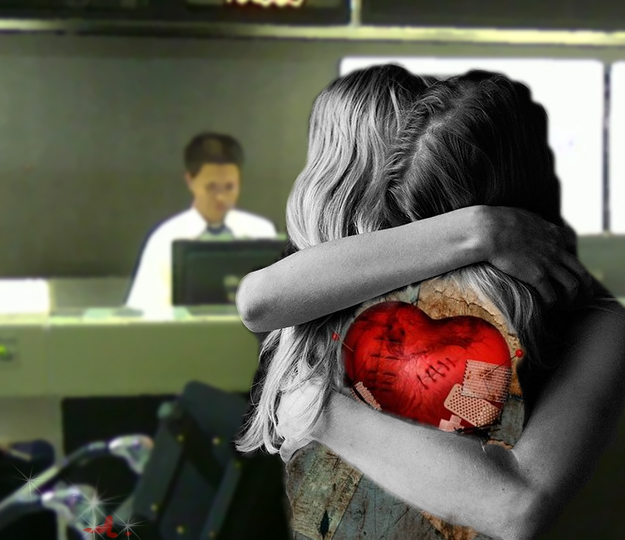 I put my arms around her and can’t even remember what I said….some lame words about..may I give you some support from the airline you are traveling with today…something an ad writer would think too schmaltzy. I do remember uttering……”I am so sorry……..” in which the poor woman sobbed on my shoulder. Her tears literally made my shoulder wet for an hour. I have never been so moved. The thought of her remained the entire day….so I made the Photoshop creation above in memory of her. I will always wonder…..what the outcome was. Not only were you born to comfort people but also to write about very moving pieces of your life. Thanks for sharing and also kudos’ on the photoshop piece.